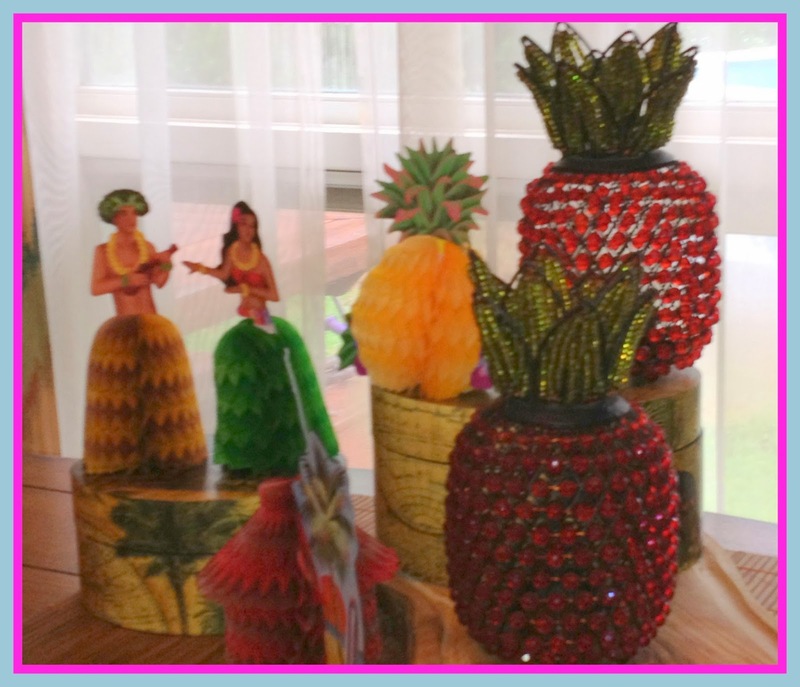 Slice of Pie Cookbooks & Entertaining: Phoebe's Luau! Miss Phoebe and I frequently have little parties ... just the two of us sometimes ... around the coffee table ... on the back deck ... on the front porch! 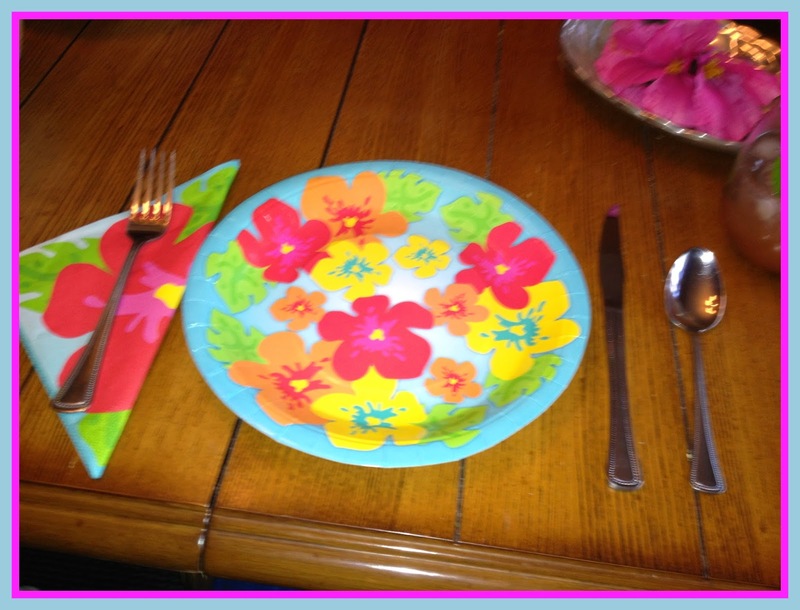 At a very young age, she really started liking pretty tables and decorating different parts of the house! A couple months ago, I promised her that we would have a luau to celebrate school being out! We made all the plans and I ordered a big box of decorations as her 'school's out' present! The big day finally came and we had the party at Phoebe's house because they have a new swimming pool. It was too cold to get in that pool on our luau evening, but we had a good time anyway! Phoebe has gone all crazy about the old movie "JAWS"! That was one of my husband's favorite movies and we had traditions of watching it every year on Memorial Day and on the 4th of July! I was not surprised that she liked it. Now you might be asking yourself who let a seven year old watch JAWS. I'm guilty as charged! I made a big joke out of the couple of icky scees and reminded her that it was just a movie. She memorized the lines ... and memorized the music ... and went around the house for weeks playing JAWS! So ... 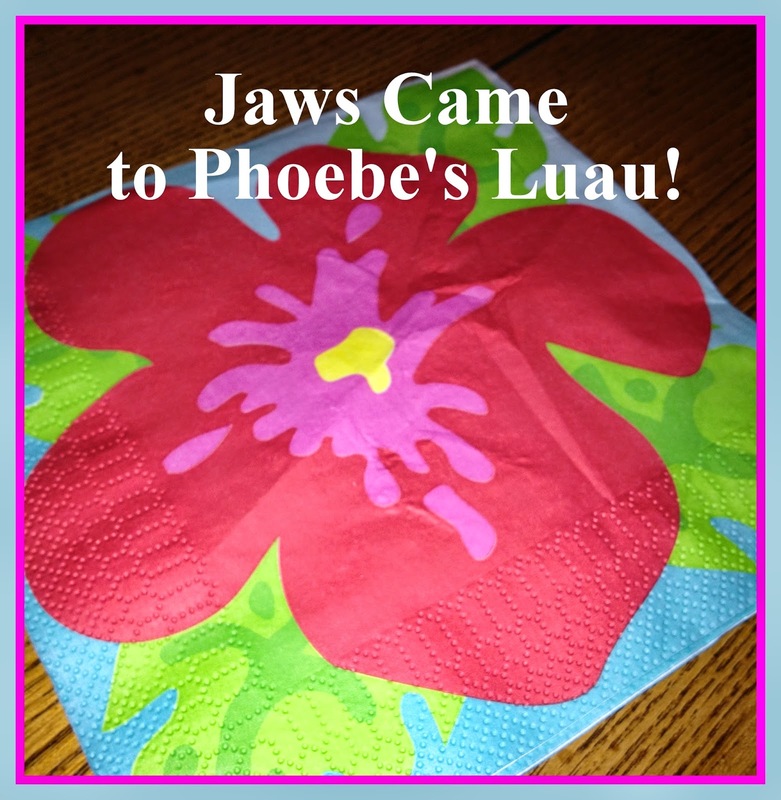 I invited Jaws to the luau! 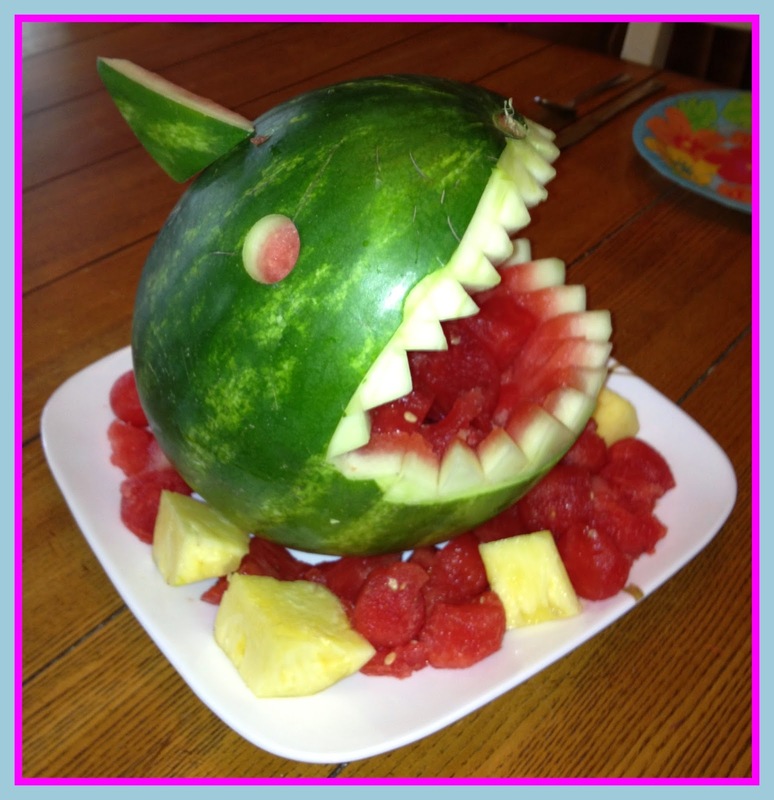 That is easy to carve ... the teeth are the white part of the melon. My pictures aren't too good ... took them in a hurry with my phone and absolutely could never get her to hold still! Here she is dancing ... I think she got her hula dance mixed up with something she is doing in dance class! We watched several YouTube instructional videos of hula dancers last summer and she really does know some of the symbolism of the movements! By the time I got to my daughter's house, Phoebe had been busy helping decorate with the items in the big box! Lots of color and unfortunately, it was too cold to be outside ... and rainy. Our food was pretty simple. In addition to watermelon and fresh pineapple in the JAWS ... we grilled chicken, pineapple and sweet red pepper skewers. I marinated and then glazed the skewers in a Teriyaki based sauce that I thickened with sweet BBQ sauce and a few other spices. 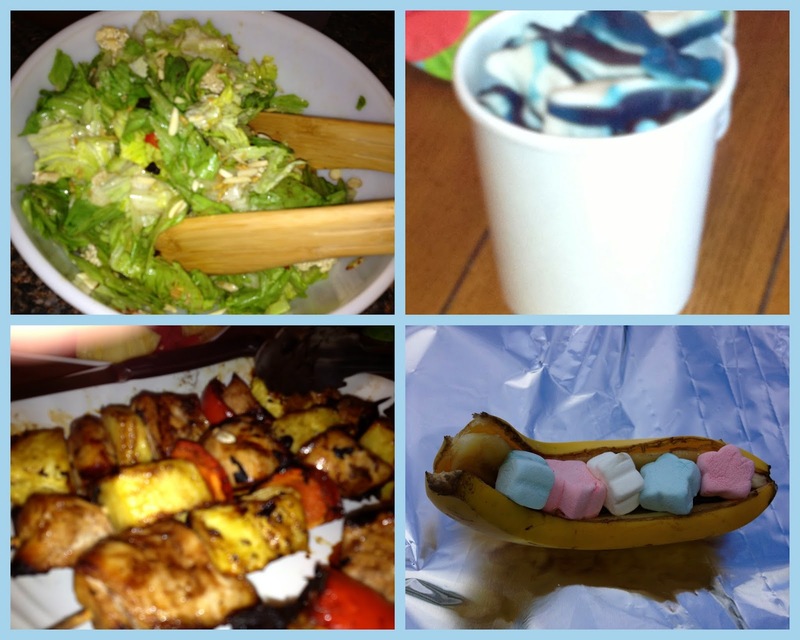 A big salad with lots of nuts and dried fruit ... and grilled banana boats stuffed with chocolate bars and marshmallows ... finished the meal. Our friend, Miss Jill, owns a frozen yogurt shop and she has spoiled Phoebe by letting her really load up on toppings including too many gummy fish or other critters! Jill brought Phoebe two containers of gummies! I hope they last all summer! Phoebe has been setting the table for some time ... and usually gets it right! 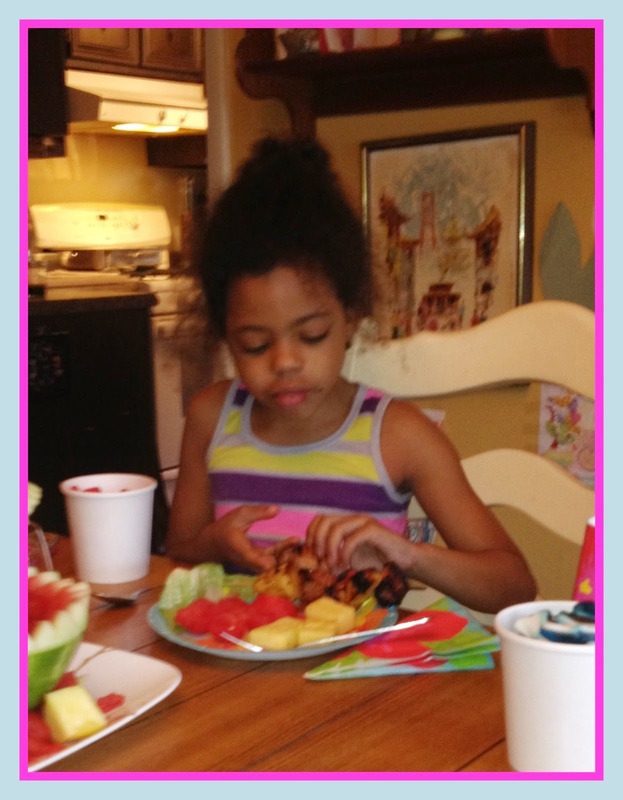 She didn't have any trouble eating our luau food ...sometimes she resists things ... but she filled up at the luau! I am a big believer in letting the kiddos get their hands all over party activities. They will never learn, if you don't let them be involved!